CREMIEUX CLASSICS lot of 2 long sleeve striped seersucker utility shirts, both size XL. Underarm to underarm-25.75”. Sleeves from shoulder seam to cuff-25.5”. Total length down the back from bottom of collar-32.5”. This is very nice Polo. It has the Cremieux emblem stitched on the left side. You will love this Polo. Cremieux Shirt Has Button Down Collar, Button Barrel Cuffs And Blue Striped Flip Cuffs. 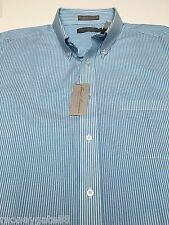 Shirt Is Light Blue And White Striped With Engraved Buttons And Front Pocket. 26" Armpit To Armpit. NICE AND CASUAL LONG SLEEVE SHIRT, GREAT QUALITY FROM DANIEL CREMIEUX COLLECTION. PERFECT FOR WORK AND GREAT FOR OUT-AND-ABOUT. BY DANIEL CREMIEUX. 32% LYOCELL. SHIRTTAIL HEM WITH SELF FABRIC GUSSETS. 19" sleeve inseam length. 23" across underarms. 23" across waist. 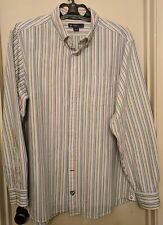 Pre-owned Daniel Cremieux Classics men's striped long sleeve dress/casual shirt. Men's size XL, 100% cotton. There are stains on the left cuff, please see pictures. Otherwise, shirt is in great condition. Please email for any additional pictures or with any questions. NICE AND CASUAL, COMFORTABLE LONG SLEEVE SHIRT, GREAT QUALITY FROM DANIEL CREMIEUX COLLECTION. PERFECT FOR WORK AND GREAT FOR OUT-AND-ABOUT. BY DANIEL CREMIEUX. 32% LYOCELL. SHIRTTAIL HEM WITH SELF FABRIC GUSSETS. Daniel Cremieux Collection. Blue and White Stripe. Daniel Cremieux Classics XL Preowned. 2 Pockets Seersucker. 100% Cotton. Pit to Pit 25. Top of neckline to bottom of the back shirt- 34-1/8". The shirt is in excellent condition. Size: X-Large. 100% Cotton. Cremieux Shirt Has Button Down Collar, Button Barrel Cuffs And Blue Striped Flip Cuffs. 26" Armpit To Armpit. BLUE,GRAY AND WHITE STRIPES. PIT TO PIT: 26". TOTAL LENGTH:32". You will always receive the exact item pictured & not a substitute. Length: 33" (top of collar to bottom of shirt). Sleeves: 26" (shoulder seam to end of cuff). Chest: 26" (armpit to armpit). Take a closer look an the photos to see the great shape its in. This Daniel Cremieux XL shirt is very nice. Product: Daniel Cremieux Golf 3 Button Polo Golf Shirt. Color: Navy Blue background with white, yellow, and light red thin stripes. One extra button at bottom of shirt. Material: 100% Cotton. Machine washable as per attached care label. DANIEL CREMIEUX. "THE DEFINITIVE SHIRT". Polo Shirt. 100% Cotton. 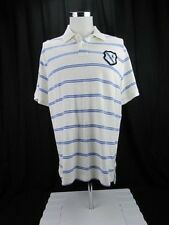 Shirt Is Light Blue And White Striped With Front Pockets And Engraved Buttons. 20 1/2" Shoulder Seam To Seam. You are viewing a men's Daniel Cremieux signature collection polo shirt. It is size XL. Armpit to end of sleeve: 6.5". Armpit to armpit: 26". Armpit to bottom: 17". Width Pit to Pit (Across Chest ): 26. Sleeves (Shoulder seam to Cuff ): 26. Length ( Top of Collar to Hem ): 31.5. Sleeve (shoulder seam to cuff): 26. Length (base of collar to bottom of hem): 26. Chest (underarm to underarm): 24.5. Cremieux Shirt Has Button Down Collar, Button Barrel Cuffs And Blue Striped Flip Cuffs. Shirt Is Multi-Color Striped With Engraved Buttons And Front Button Pocket. SLEEVE: 24.5 ( high point of arm hole to sleeve opening ). -SHOULDER: 21 ( side to side). -LENGTH: 31.5~32.5 (top of the shoulder to bottom hem ). -CHEST: 27 ( underarm to underarm ). - Gently pre owned, in great condition. Well cared for Daniel Cremieux long sleeve XL shirt. Button down collar, left chest pocket, shirt tail hem with center box pleat. Width (across chest): 26”. Length: 29”. Item# 2309a2n Look good. Save money. Smile more! Thank you for browsing! Condition: Shirt is in good used condition with little signs of wear or fading. See pictures for details. Please note all measurements are APPROXIMATE: Measurements: Pit to Pit (Across Chest): 23” Length (Top of Collar to Hem): 26.5” Sleeves (Shoulder to Cuff): 9” Please message me with any questions or issues. Material: 80% Cotton / 20% Silk. Condition: This Shirt is in Very Good pre-owned Condition. Color: Blue. 100% Cotton. Our goal is to make sure you are satisfied no matter what! Our goal is to make sure you are satisfied no matter what! Pre-Owned Very Good Condition No Stains Or Holes. This is one really cool shirt with snap button in the middle of the shirt and the cuffs. 100% Cotton--Machine washable with light iron.